On the origins of war and the preservation of peace · One Book. One Author. One Hour. Notes on front endpapers: Hegemony. How much do people or individuals matter in keeping the peace? Power--Realists--Neorealists. Honor, Fear, Interest--Thucydides-motives for war. Fox and Hedgehogs. Method-comparative narrative history. Cuban Missile Crisis-new material. Fritz Fisher-historian on Germany. Pericles, Augustus, Bismarck. Peloponnesian War, 60 pages; WWI 133 pages; Hannibal's War 41 pages; WWII 136 pages; Cuban Missile 111 pages. Lamb numbers the 9 books listed in: Other books by Donald Kagan. Underlinings/Notes: Underlinings: Paine, Montesquieu, Kant--substitution of republics for monarchies guarantee lasting peace. Durants in 1968 : 268 years free of war from 3,421 years. Realists--states/nations seek power, as much as possible; Neorealists--search not for power, but security. Peloponnesian War/WWI terrible end to extraordinary period in history. Lamb underlines information on governments and actions which led to war, peace, and the consequences of war and peace. Notes: "Sons Bob and Fred," "Hoover," "Durant 1968," "power," "Realists," "Neorealists," "honor, fear, interest," "1914--60 million Germans, 40 million Frenchmen," "Roman empire lasted 700 years," "Reparations Bill 5 Billion a year 1921," "Michael Bechloss, have learned much, Peter Wyden-Bay of Pigs-Wall, B.J. Allyn-1992," "Prussia," "The Future," "Germany, Japan, China, Russia," "War is more common," "what works," "History," "Americans," "U.S. is faltering," "Revert to type." 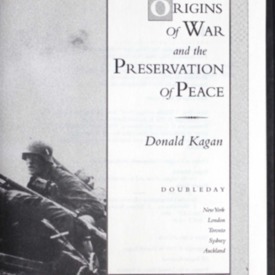 Kagan, Donald, “On the origins of war and the preservation of peace ,” One Book. One Author. One Hour., accessed April 21, 2019, http://booknotes.gmu.edu/items/show/302. Professor Kagan reveals the common threads that connect the ancient confrontations between Athens and Sparta and between Rome and Carthage with the two calamitous world wars of our own century.